“Teach us to number our days aright, that we may gain a heart of wisdom.” Psalm 90:12 has great relevance as one day passes into the next, as one year passes. So, in the few verses before it, I have learned a part of that wisdom. “The length of our days is seventy years–or eighty, if we have the strength; yet their span is but trouble and sorrow, for they quickly pass, and we fly away.” Yes, life is sometimes…..
All good stories start out, it was a dark and rainy day, right? Well, December 28, 1962 was snowy, sleety, foggy, drizzly, and dastardly cold. We wanted a Christmas week wedding, and we got what comes along with that desire in Massapequa, New York. To make things worse, our honeymoon in the Pocono Mountains saw outdoor restrictions because the wind chill was well below zero, so many of the planned activities were canceled. We did, however, make candles. Whoopie! As part of my life of Thanksliving, I continue with another celebratory idea. Why not celebrate Christmas every day? When we think globally what that might look like, I’m hoping there….. In the midst of hurrying and scurrying and getting ready for Christmas, take a brief respite and enjoy the introduction to my new book, Bless You Bouquets: A Memoir. 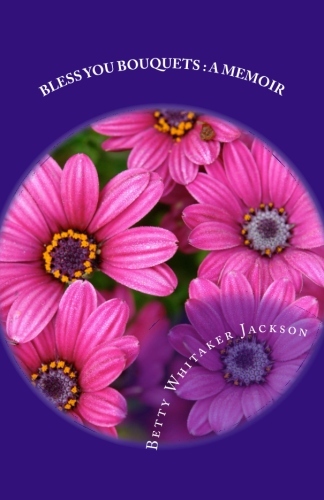 This book celebrates Garden Gifts to Special People in my Life Walk. Sit down in a comfy chair with your favorite cuppa or a nice glass of wine, and enjoy the first of many interludes in my book. You’ll be glad you did! Picture yourself in the most….. This is the cover of my new book, Bless You Bouquets: A Memoir available on Amazon.com for $17.99. In it I recount stories, poetry, essays, and tributes to people who have blessed my life-walk by their friendship, wise counsel, and love. I honestly believe there are no coincidences for believers in God’s…..
From my new book, Bless You Bouquets: A Memoir, I present Bless You Bouquets to my friends, the Praying Magnolias, whose supportive love and encouragement brighten my life in this place. I would present to these lovely ladies buckets full of posies. For their faithfulness, irises in every variety and color, for they have colored my life with beauty; for their love and friendship, bright pink peonies (minus the ants), fragrant and sweet; for their cheerfulness and optimism, bright mums….. This story is part of Chapter 8 of my forthcoming book, Bless You Bouquets: A Memoiravailable on Amazon.com and from my website at www.bettyjackson.net. I hope it makes the Christmas Story come alive in a new way for you to celebrate the Birth of our King. You have permission to use it with your family, at church gatherings and services, and wherever you think it will bless others. Just give credit to the author and the book Bless You…..
Just finished final edits on Bless You Bouquets: A Memoir. It has been a fascinating journey, reviewing the people, places, ideas, and factors which have shaped me as a person. I am eternally grateful to those who loved me, guided me, and helped me understand that giving to others, even little flower bouquets, is such a joy. My hope is that many will read this book and go and do likewise. It is important to leave a legacy, to tell….. I am sure, historically, this day brought tears to many. D-Day meant separation from loved ones, death and maiming, and a world in upheaval. Let us pause for a moment to think about what that Christmas season must have meant for so many. Let us remember those whose tables will have an empty seat this year. Let us remember empty cribs bring untold tears. Let us think of those in nursing homes and rehabilitation centers and hospitals who will not…..
We’ve shared our home with two cats the last five years or so. Zach is our grey lovey cat who pretty much adopted us when he rubbed our legs and looked at us as if he knew we would be his new people parents. He is a delight, although the last two years, he has been totally freaked out by thunder, lightning, wind, and strong rainstorms. We think it occurred when a storm happened while we were away from home.